Robert Thollon, french fighter pilot. Born in Marseille on May 14th 1914, Robert Thollon entered the French Air Force Academy in October of 1936. After successfully obtaining his pilot license as well as his aerial observer license, he graduated from the fighter pilot school in Romilly first in his class with the rank of Second Lieutenant. In March 1939, he was assigned to fighter group GC (groupe de chasse) I/8 in Marseille-Marignane, a unit under the command of Major Colin. It was with this group that he distinguished himself in May and June of 1940, achieving 8 confirmed victories (including 4 on an individual basis) becoming the top scoring Bloch 152 pilot. On the 5th of August 1940, Major Colin wrote in his campaign report the following appreciation about Robert Thollon: "Young and brilliant Officer, first in his graduating class, has shown since the first aerial engagements that he possesses the qualities of a first class fighter pilot. Conservatively daring, he has been a great help and a role model for his fellow pilots in his unit by giving them judicious advice. He constantly demonstrates determination, and a magnificent spirit of sacrifice. In six weeks, he has been credited with 8 victories which deserved him 5 citations in the order of the French Air Force. 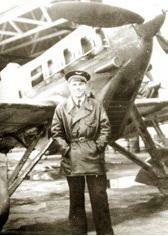 Additionally, on May 17th, he brought back a repaired airplane from an abandoned airfield under enemy machine gun fire ". Disheartened and refusing to accept the defeat, Robert Thollon asked to be put on leave under the stipulation of the armistice so that he could continue " his " own fight. On October 1st 1940, he joined an organization created by the Vichy Government called "Jeunesse et Montagne" (Youth and Mountain) under the direction of general d'Harcourt the former inspector general of the fighter arm. This organization had for purpose the regrouping of French Air Force cadres without assignments. Based on the German youth organization concept, it progressively became a center with other purposes. The contacts with the resistance networks were beginning to become organized, mainly under General Carayon the secretary of Air defense. But in Vichy, surveillance was re-enforced and 138 French Air Force officers were arrested between 1943 and 1944. Some of them were deported, and Major Colin was shot by the Gestapo firing squad in February 1944. It was without any doubt the event that strengthened Robert Thollon's determination to resist the Germans. As the "Jeunesse et Montagne" center was moved to Murols in the heart of the Auvergne region in April 1943, Thollon now promoted to Captain in September took charge of the resistance organization for this region in May 1944. It was around this period that he was promoted to Major. The school under the direction of Thollon joined the "maquis" (the underground) on June 3rd, three days before the D-Day invasion. Its 160 men came to enlarge the ranks of the Renaud group. But, they only had at their disposition a total of 19 sub-machine guns, and a few hundred ammo. On July 6th, thanks to two airdrops, the group's force now up to 4 companies and 350 men was finally ready for engagement. It was Robert Thollon who led his men in combat on August 7th along National Highway 122 between Aurillac and Murat, not far from Vic-sur-Cère. There, he set up an ambush for the German garrison from Aurillac that was moving towards the Northeast. The combat would last for five hours with the Germans receiving artillery and heavy machine guns re-enforcement. The group retreated after killing about thirty German soldiers, but losing three of its men in the process. The German garrison having resumed its evacuation towards the East was again harried between the 11th and the 13th of August at the foot of the Lioran mountain pass, about 10 kilometers from Murat. The German column was finally disengaged from battle with the intervention of the Luftwaffe (probably by the group "Bongart" flying Reggiane Re.2002s). There was ten dead on the French side, but it was estimated that the German lost were four to five times greater, and most importantly, the column had been brought to a halt for more than 72 hours, permitting other resistance elements located further East to get ready to "greet" them. Then, the group Renaud participated to the operations that ended with the surrender of the German garrison from Rueyre on August 19th. This success incited the military command of the Cantal region to surround Saint Flour, despite a garrison of 500 men well equipped with heavy material. But, the Germans having at their disposal lories equipped with machine guns caused this daring attempt to fail. Renamed "colonne rapide" (fast moving column) number 6 of the Auvergne region's underground, the group Renaud was integrated with the Lyon assault section on September 11th. Thollon and three officers of his command would be the first to enter the Lyon courthouse on the 3rd of September. Thollon would again participate in the difficult battles of Decize, and would also take an important part in the surrender of 18,000 Germans to the Americans in the evening of September 11th. In November, Robert Thollon left the underground and rejoined the French Air Force family. On November 22nd 1944, he arrived in Toulouse to take command of GC II/18 Saintonge, derived directly from the underground fighter group FFI Doret. There, he would participate in several offence missions over the Pointe de Grave and the Atlantic pockets. On January 9th 1946, while still leading GC II/18, he was summoned by the personnel service, informing him that he was now assigned to the department of "sports aériens" (sport flying)! Infuriated, Thollon intervened directly to general Bouscat and was transferred as second in command of the 6th Wing. In May 1946, he arrived to the 3rd Wing based in Germany as the second in command, and then he was promoted to Wing leader in December 1946. Unfortunately, on February 24th 1948, Robert Thollon fell while vacationing in the mountains and was killed instantly. (X): total number of pilots participating to the destruction of the enemy airplane. The Trident: The emblem of the 1st Escadrille of " Groupe de chasse "
Second Lieutenant Robert Thollon in front of a Dewoitine 510 of GC I/8 in Hyères, in February 1939. Second Lieutenant Robert Thollon takes charge of the first Bloch 152 (Number 153) assigned to GC I/8 on November 23rd 1939.